The Sakura electric eraser weighs in at only 2.6 ounces. Its compact design and lightweight makes it easy to use for a quick clean up and yet it has the power needed to take on tough jobs. 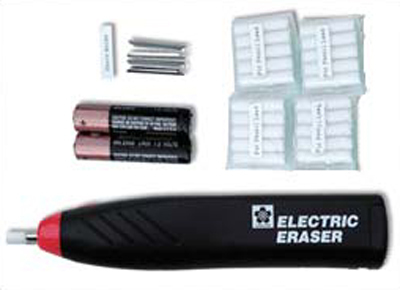 The Sakura electric eraser kit comes complete with ten vinyl eraser, 10 blue solvent erasers for use on ink, two extra erasers chucks and two AAA batteries.